Imagine that it is freezing outside and you are in your cozy bed enjoying a TV show with a hot cup of delicious coffee, sounds like heaven right? The enthralling TV show kept you submerged in another fascinating world for long enough that your coffee gets cold (and you have just taken few sips of it). The sweet addiction of coffee starts to kick in and the urge to have a hot cup of coffee begins to reach its climax. You have only one option and that is to get out of your bed and reheat your coffee in the oven. But…..but it is cold outside and you are feeling too lazy to get out of your warm and comfortable bed. This is how most of the coffee lovers have to experience every now and then. Have you ever wished if there was any solution to this ‘horrifying’ dilemma? Whether you are at work, home or going outdoors, keeping your coffee hot in a winter season is not possible until or unless you have some kind of ‘assistance.’ Hey, there is no need to make a sad face, cheer up! There are some ways which can be used to keep your coffee warm. As a matter of fact, there are many effective and totally reliable ways you can use to keep your coffee warm. We have compiled a list for you and we are 100% sure that you’ll have the solution to your problem. So, without a further ado, let’s get started. A mug warmer is like a hot plate for your coffee which is portable. It is quite perfect for home or office use and can be used by plugging it into any plug such as a USB cable, AC adapter or even a car adapter. There is a convenient cord length which makes it suitable to use anywhere. Also, they come quite cheap and complete the job very well. 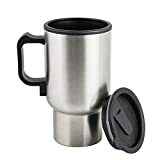 Here is one of the best mug warmer that is loved and used by many. This solution is best for people who like to drink coffee within an hour. Covering your cup of coffee with a scarf, jacket or anything with some thick layering can provide the essential insulation which is good enough to keep your coffee warm for at least 40-60 minutes. These mugs can be a bit pricey but it can be said with certain assurance that the money you’ll spend will be worth it. The reason why a temperature control mug is so much in-demand is that it offers way too much convenience to the user. You can customize the temperature of your coffee according to your taste and this means that there will be no more trips to the microwave, especially in winters. 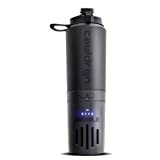 One of the best temperature control mug providing companies out there is Cauldryn and Ember. If you are on a budget and want a quick solution on how to keep your coffee hot in winters then an immersion heater is a better option for you. It is also best for people who are not much into portable plates (mug warmers). The best thing about an immersion heater is that it can be used almost anywhere. All you have to do is to plug it in any electricity socket and heat your coffee anytime, anywhere. It is an advanced form of a Mug Warmer. The precision temperature technology in a car warmer ensures that your coffee remains hot and at the desired temperature. Get yourself a car warmer if you love taking coffee to work or your son/daughter’s soccer practice. There is always an option to go for a traditional solution – getting a coffee thermos. 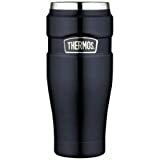 A thermos is specifically designed to control the temperature flow of any beverage, hot or cold, for up to 24 hours. Get a thermos and start quenching your thirst for coffee whenever or wherever you want. 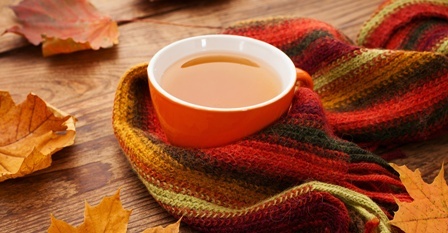 Absopure has written about some coffee drinks for winter, that’s a good read. We hope you find the aforementioned list helpful like thousands of our other readers. It is imperative to understand that keeping the coffee hot is not the only objective because you want your coffee to taste fresh as well. Every solution mentioned above ensures that your coffee remains hot and tasty. Since you know the answer to keeping your coffee hot in a winter season, what are you still waiting for?